The journey begins at the southeastern corner of the map, heading north towards Hyas Lake on the Deception Pass Trail. There are about 4.5 miles of flat trail before the climb begins just after Upper Hyas Lake. From there, you have 1/2 a mile climb to the junction with the Robin Lakes climber’s trail. This is just a worn boot path cut straight into the Earth. It goes up at an aggressive incline and scrambles over rock and root for a mile and 1000 feet of elevation to Tuck Lake. Stop for a breath or a camp there. If you get there early enough, grab the camp on the rocks over the south side of the lake. There is a perfect spot tucked into the rocky outlook there, and you’ll be bouncing between the beautiful views of Tuck Lake and Mount Daniel on either side. The campsites at Tuck are tightly packed, but this is a good place to stop if you want to take the remaining hike up to Robin Lakes as a day trip. From there, you must thread the gap between Tuck Lake and Tuck’s Pot and begin an aggressive scramble over rock and ridge another mile and 1000 feet up to your final summit at Robin Lakes. As you climb, don’t forget to look back for some epic views of Tuck lake and Mount Daniel in the background. Near the end of your climb, you’ll go from a boulder-filled trail to cairns along sheer granite slabs. This is the sign that you are closing in. Be careful to follow the cairns along the angle of the slope. It’s easy to turn up for the final climb too early and find yourself above the trail. From Robin, you can also take an extension up to Granite Mountain or wander over to Granite Potholes. Both are great options to extend your trip. If you stay at Robin long enough, you’ll also see this little friend. He and his buddies like hanging out here. I have enjoyed following them around for hours, but take care. I’ve heard horror stories of hikers being driven to boulders in an effort to get away from these aggressive camp thieves. Be sure to follow closely to leave no trace while you stay up in this sacred space. When you finally get over the disappointment of having to leave, make your way back down the trail to the junction with the Deception Pass Trail, and hook a right. You’ll walk north for about 1/2 a mile up a gentle incline before reaching a 4-way intersection. Two of the forks lead up and down the Pacific Crest Trail (PCT). Directly to the north leads up the PCT to Deception Lakes. A beautiful spot if you want to extend your trip. But you have even more beautiful sights in the other two directions. The trail to the south and west is the other direction on the PCT, and you’ll be headed there tomorrow, so never fear. The trail to Marmot and Jades heads north and west over Blue Ridge. You’ll see many beautiful subalpine meadows along this trail, including a small pond about 1/2 a mile in that would make a great base camp for someone wanting to explore the region. But don’t stop there, keeping going on the long trail to Marmot Lake. You’ll climb a bit, go down a bit, and then have a final climb up to Marmot. When you get there, take your pack off and stay a while. Most stop here and find a nice spot along the side of this spectacular lake. There are many campsites here, although if you are late on a busy weekend, you may be up close to others as the trees thin out at this high lake. This can be a nice base camp from which to reach No Name and Jade Lake. If you have the energy to muster on, keep packing through a brushy trail along the south side of the lake. Eventually you will break out into boulder fields which you’ll need to traverse and eventually climb. 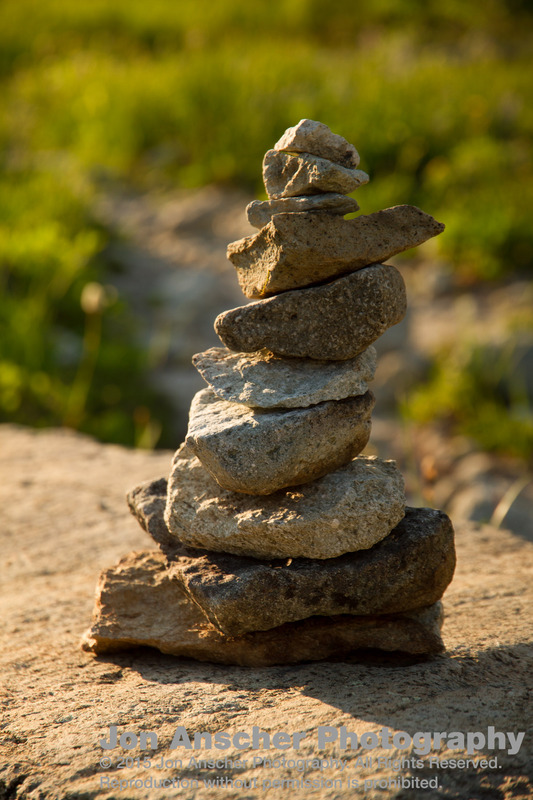 Too many hikers have placed false cairns here, so keep your eyes sharp. Eventually, you will break above the boulders and find yourself on a spectacular meadow that walks the fine line between the alpine and subalpine. Some way in, you’ll come across No Name Lake. It is a beautiful spot to stop for a spell, but don’t be fooled, even more beauty awaits ahead. Keep hiking along the small mountain path until you see the green waters of Jade. This lake’s unique color is derived from the glacial till that runs off Mount Daniel’s Lynch Glacier. Although I’ve never been at its waters, there is a significant glacial lake between Jade and the summit of Mount Daniel. Just at the foot of the Lynch Glacier is perhaps one of the largest Glacial tarns I’ve seen. Be careful, the trek from Jade to this unnamed beauty can be treacherous, especially as the snow and ice melt in warmer weather. Another alternate option is to summit Daniel from this side, although this is a technical ascent as it involves glacier travel. Once again, you have come out to splendor and the only road is back from whence you came. This is perhaps the longest track of trail you will need to repeat int his loop hike, but repeat it you must: some 4–5 miles back to Deception Pass. Once back a the pass,take the fork heading south and west on the PCT. You have several miles to climb out of the forested valley wall and a significant river to ford. This can be a tricky crossing at times. Be sure to check back at Deception Pass for signs left by the Forest Service. This crossing has been known to flood, forcing through hikers to detour around to Hyas Lake. Do some research before you go, so you don’t end up in the same boat. If you made it past the river crossing, you’ll continue to steady climb. You’ll come across a nice little bowl in the side of the mountain if your energy is waning and you want to stop for a long lunch break, or even for the night. There is only one or two sites here though, so you may need to compete with through-hikers. If you have the energy, continue on as the trail begins to climb more aggressively up to Cathedral Rock, towering above a meadowed subalpine paradise. From there, you will come across two different intersections. The first is your final hike back down to the parking lot. Look down it, and think what beautiful sights await on your final day out, then turn away and head up in the direction of Cathedral Rock. You will pop up over a ridge, then head back down a switch back or two until you hit the intersection with the Peggy’s Pond Trail. There are warning signs here of the rough terrain ahead. The trail to Peggy’s Pond has been eroded over the years and there are a couple very short scrambles on your way to the lake. The scrambles are not bad, but they are on the side of a very steep and rocky slope, so be sure to step with care. Once across the worst parts, you will climb up to Peggy’s Pond. There are two paths now, take the one to the right as the other is older and has grown over with lack of use. At the top of your climb, you will come to either the smaller, lower, and unnamed pond or to the large Peggy’s Pond. Peggy’s Pond is a beautiful stop, and well worth a break or a camp. You can setup camp at Peggy’s and call that base for your attempt of Daniel, or you can keep going and begin the climb earlier. Circle Lake is a large alpine lake below the summits of Mount Daniel. Although I have never been there, it looks like it would be a spectacular place to setup camp. And there is a second trail from Circle up to Mount Daniel. Regardless, it is worth taking some time to explore the meadows surrounding Peggy’s Pond and the foot of Mount Daniel. There is no end to the beauty here. Regardless of your intent, from Peggy’s you will want to hike out along the trail until you see a cairn sitting in the middle of a meadow, between two small ridges. This is your trail marker up to both Circle Lake and Mount Daniel. Here your climb begins in earnest. Remember to pace yourself. The small path leads up the side of a ridge, and splits at several points. Pay attention to where the trail leads. One heads too far to the right and cliffs out along the ridge line. The other heads far to the left and is your way to Circle Lake. Circle Lake is a destination worthy of itself. It’s clear waters sparkle from above, and call to the weary traveler. If you do well, and stay the center path, you will find yourself trekking up to Mount Daniel. The trail will be tricky at times, so go slow and pay attention. And of course look around. There are countless views that are break taking beyond imagination. Mount Daniel has three summits, and despite perception, the last is the highest. You will see the first summit along much of your early hike, so don’t be fooled, you are going around behind and beyond that false peak. Once you finally find your way to the summit, you will find your breath taken away. Whether from the climb or from the 360 degree panorama, I’ll let you decide. Mount Daniel is the highest peak in Pierce Country, so you will find yourself above everything nearby. It offers one of the most amazing views in Washington. Once you’ve finally taken it all in, don’t forget your hike down. This is not a trail you’d want to do at dark, so give yourself plenty of time to get back to whatever lake your camp is at before the sun ducks below the horizon. Assuming you did not try to climb Daniel and hike out in one day (a task I can tell you from experience is an exhausting one), you will pick up the trail back to Cathedral pass in the morning. You will scramble back out, head up the hill (and north on the PCT) to the Cathedral Pass intersection. From here you will wander your way through subalpine meadows. You’ll pass by the scenic Squaw Lake, a great destination for a short overnight (a mere 2 1/2 miles from the trailhead). The last few miles will likely seem like the longest, as you finally duck into the trees and begin the final hike out. But you are bringing memories of some of the most breathtaking places in Washington, so let those images sift through your mind as your journey comes to an end, and be thankful for the opportunity to enjoy hiking the Deception Pass Loop.